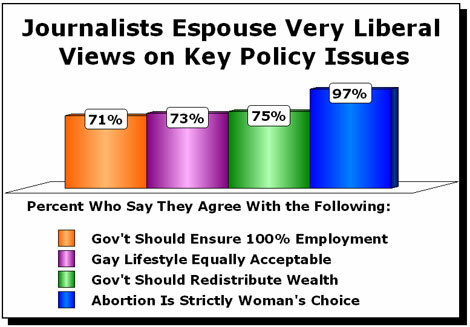 They found the media elite held strongly liberal views on abortion, homosexuality, and a range of economic issues. 'Despite the discrediting of centrally planned economies produced by the collapse of the Soviet Union and other Communist regimes, attitudes about government control of the economy have not changed very much since the 1980s,' the authors marveled. More than three out of four 'elite journalists,' 76 percent, reported voting for Michael Dukakis in 1988, compared to just 46 percent of the voting public. An even larger percentage of top journalists, 91 percent, said they cast ballots for Bill Clinton in 1992. That same year, only 43 percent of voters picked Clinton, who nevertheless won a three-way race. 77 percent of these journalists identified themselves as "Democrats," compared to just five percent who accepted the "Republican" label. And nearly four in ten (38%) identified themselves as "liberal," vs. just three percent who called themselves "conservative." Nearly all of the media elite (97 percent) agreed that 'it is a woman's right to decide whether or not to have an abortion,' and five out of six (84 percent) agreed strongly. Three out of four journalists (73 percent) agreed that 'homosexuality is as acceptable a lifestyle as heterosexuality,' and 40 percent agreed strongly. Seven out of ten journalists (71 percent) agreed that 'government should work to ensure that everyone has a job,' and 30 percent said they strongly agreed with that statement. Three-fourths (75 percent) agreed that 'government should work to reduce the income gap between the rich and the poor,' and more than a third (34 percent) strongly agreed. Relatively few journalists (39 percent) agreed that 'less government regulation of business would be good for the economy,' and just five percent strongly agreed with this sentiment.